Catharine Chase’s entire life is built on a secret. In 1972, at the tender age of sixteen, she got pregnant. An embarrassment to her parents, Catharine was exiled to a maternity home to carry out her pregnancy far away from the watchful eyes of their tight-knit community. What they didn’t tell her is that she wouldn’t be allowed to keep her baby. I will freely admit to a bias going into this review. I've known Erika through her blog Beyond the Gray for two years. During that time I've followed her journey to publication with its many trials, obstacles, and as you will find today, triumphs. (To read more of her journey, in her own words, please see our interview below.) However, familiarity is a double-edged sword, as I dipped into her debut Empty Arms, I wondered, would I like it? Would I be able to review it without bias? The answer on both counts is: yes. I can happily announce that Empty Arms is the second book I will award five stars. Erika writes about the heartbreak of adoption and infertility with sensitivity, without being smarmy. She creates a complex moving story, that has a satisfying, not predictable, ending. Her characters are realistic and fully drawn, they are well rounded individuals instead of cardboard cut-outs. All of this is remarkable because a book on this topic could have gone horribly wrong and descended into a Hallmark movie channel knock-off, a feel-good bit of fluff with characters who reveled in an happy ending, but which readers would only be able to dream about rather than relate to. Instead, Erika has shown an incredible depth and maturity for a debut novel by writing characters who we could expect to meet at our neighborhood diner or a high school reunion. 1. When did you first decide that you wanted to become a writer? I've had a passion for writing since I was a little girl. In fact, I wrote my first book when I was five or six years old - it was about a little girl who had 18 brothers and sisters, which is funny in retrospect because I was an only child at the time (and apparently trying to send my parents a message!). I decided to seriously pursue writing about six years ago when I realized that I didn't feel fulfilled by my professional pursuits. In the three years that followed, I continued working full-time and writing my first novel, The Ardent One, in my free time. When it was done, I spent the better part of a year trying to find an agent and publisher...with no luck. A few kind agents took the time to tell me that though they liked my voice, they felt there wasn't much of a market for my book. So I rewrote it, made it stronger, and sent more query letters. No bites. Ultimately I decided to listen to their feedback and move on to the next book. It was tough to see my first book banished to a desk drawer but it taught me 2 important lessons: 1) that I was capable of writing novel-length fiction and 2) what not to do the next time around. 2. Where did the idea for Empty Arms come from? And how long did it take you to write? The idea for Empty Arms came from a story that my Nana told me about a family friend who got pregnant when she was a teenager and was forced to give up her daughter for adoption only to later learn that she couldn't have any more children. This story inspired Catharine's character, and through my research I discovered that 4 million women went through a similar "forced adoption" experience between the 1940s-1970s, and I just knew that this was an important topic that I wanted to explore. The first draft of Empty Arms took me two years to research and write. Then I worked with an amazing developmental editor who helped me see how I could make the story stronger. The only problem was that implementing her advice meant rewriting most of the book. That revision took an additional year but in hindsight, it was definitely worth the extra time and effort. 3. 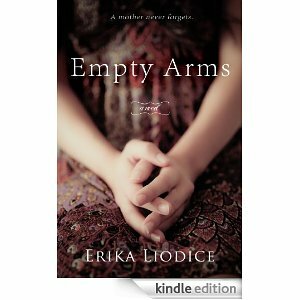 Why did you choose to self publish Empty Arms? What was the self publishing process like? A lot has changed in the publishing industry since I started following it six years ago, and as a result it feels like there is less room and fewer resources for emerging writers like myself. On top of that, I wasn't convinced that "traditional publishing" could offer me what I want: creative control of my books and writing career. So I decided to approach things a bit differently and I started my own small press, Dreamspire Press, which is currently publishing Empty Arms with plans to add more titles next year. In addition to writing, my dream is to be able to work with other passionate writers and help bring their work to life. 4.What's next? Do you have an idea for your next book and have you started writing it? I do have an idea for the next book, but it's so premature that I can't reveal it just yet. All I can tell you is that, like Empty Arms, it's another work of "social impact fiction" (which is how I like to think of the fiction that I write). 5. What is the most valuable lesson you've learned from launching your first novel? Do it right. There were so many times during this process when it would've been easier to just cut corners and publish the book faster - the major rewrite that took me a year, for example. I also had the book copy-edited not once but three times to make extra extra sure that it's error-free. I've learned that despite how tired I am or how eager I am to start working on the next project, going the extra mile and making your book the absolute best it can possibly be is the most important thing you can do. Empty Arms is a labor of love, both in work and in storytelling! Uma ótima semana e Deus abençoe grandemente!